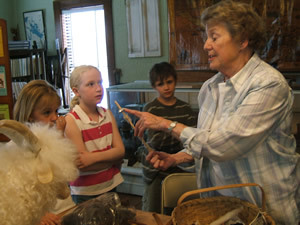 During the month of May Gilford’s Historical Society enjoys sharing our heritage with the third grade classes. Today we will share some excerpts from the students’ thank you letters that they wrote after visiting the Grange building. Each class was divided into four groups and they rotated through four activities/areas. We were all impressed with how attentive, well behaved, and interested the students were. Upstairs, we were fortunate to have four volunteers sharing heritage arts/crafts. Ellen Gelotte brought some fleece and demonstrated drop spindle spinning. Carol Dale brought a number of hooked rugs and let the students try their hand at hooking. Carol Anderson explained how to braid a rug, while her daughter Sarah explained that all young girls would also have learned how to stitch a sampler and she showed them some. Shannon wrote, “…it was fascinating to see how they made braided rugs. Also, learning how to rug hook was really neat.” Brianna wrote, “My favorite place was the rug hooking. It looked relaxing. I thought the rugs were pretty.” Gillian seemed surprised when she wrote, “I never knew hooking was so EASY!! The fourth activity/area they took part in was titled “Early Day Chores”. Mary Chesebrough, Jim Colby, Jerry Lacroix, and Kathy Lacroix shared the responsibilities. The girls put on a long skirt and a mop cap (ask any girl why it was called a mop cap) and the boys pulled on overall, and then they were ready to go outside and try their hand at doing chores. Nate wrote, “I was surprised to learn that the boys cut logs into firewood, NOT the men.” The men helped the boys use the old bucksaw and sawhorse that is kept in the store. Even though there was “girls’ work and boys’ work”, the girls wanted and had a chance to try their hand at this chore. Tyler wrote, “My favorite part was putting the overalls on and going outside, finding the eggs, getting the water and cutting the wood. It must have been really hard for the people to do all that work! Ricky thought, “It is gross that you wear the same outfit for a week and have only one bath a week.” The girls tried using a scrub board to ”wash” some clothes (Monday’s chore), hung them on the line to dry, and then tried using the heavy irons (Tuesday’s chore). I was pleased by the way one boy summed up his chores when he wrote, “I had super fun egg hunting. I liked sawing the wood. I had a real good time. Enthusiastically, Louis”. I wish that there was space enough to include excerpts from all the letters received from Mrs. Cozarts’ and Mrs. Oellers’ classes. All of us have enjoyed reading the letters; it is interesting how different aspects of the experiences appeal to different students. We also are impressed with how well written their letters are. Stay tuned for a future article to read what students from other classes have to say concerning their trip to the Meetinghouse and to the Rowe House. Besides appreciating the time and effort of our above mentioned group leaders, our time keepers also deserve credit for keeping us to our allotted time so the groups would rotate smoothly from one area to the next. They were Elizabeth Mead, Priscilla Puleo, and Donna Schinlever. For information about Gilford’s historical society and a listing of upcoming events, go to gilfordhistoricalsociety.org, e-mail at thomames@worldpath.net or call 527-900.